In today’s harried world, effective time management in customer service is a crucial. When was the last time that you actually felt that you had time to do everything that your boss or customers expect from you? There is an ever-growing list of tasks to accomplish for customer service professionals. This is especially true in customer care centers. In addition to understanding the needs, wants and expectations of a diverse customer base, you must also deal with a variety of job related functions. Some customer service professionals have learned to better manage their time than others. One way to improve on your own time management in customer service is to observe coworkers who seem to be able to easily accomplish their work and efficiently interact with all types of customers. Ask them for advice or opinions about things that you might do to better harness elusive time. If you can master yours, there is an opportunity to reduce your stress and improve job performance while better satisfying your customers. The following are some proven strategies that can assist you in your efforts to move toward better time management in customer service. Evaluate Your Perception of Time. Depending on your personal background, influencers and cultural values and beliefs, you view time in a manner that could differ from some of your customers and others around you. Once you recognize your time preferences, you can start to work on improving how you do things. For example, you may either currently take your time and are slow and methodical in accomplishing tasks. Or, you may rush from one task to another while quickly trying to multitask and get many things. In the first instance, trying to do everything perfectly could be causing a backup in calls or customers waiting for service. In the second example, you may be frustrating and disappointing others because your performance is substandard in their view. The key is to find a balance between the two approaches. Asking your customers or others questions to explain their expectations can sometimes help you realize that you are not doing what is actually needed or wanted. Pay attention to verbal and nonverbal cues when interacting with others. Based on their comments or cues, you may want to adjust your service delivery accordingly in order to enhance customer satisfaction. Examine Your Time Reality. Everyone has the same amount of time each day (86,400 seconds, 1,440 minutes, or 24 hours). Some people use their time more efficiently than others do. Depending on the type of work environment in which you find yourself, your stress may increase because of your difficulties in using time effectively. For example, if you work in production areas (e.g., telesales or customer care centers) where you are held accountable for production rates, have timed standards for productivity, or work at a hectic pace, time can seem like your enemy. Often, high levels of stress may be caused by too few people handling too many tasks. In such environments, you may often have to work extended amounts of overtime or on weekends and holidays in order to meet established goals or standards. The frequent result is that you have little time to think before you speak or act. This is why a good system for time management and effective strategies can come in handy. Even if you can squeeze out a few minutes here and there, those precious minutes can help you efficiently deal with your time reality and more effectively serve your customers or accomplish other tasks. Determine Relativity of Projects or Tasks. Assigning priorities is a matter of relativity. Some tasks and projects are rated higher than others. You should be guided by the question “What is the best use of my time?” Many people fill their daily schedule with frivolous or easy tasks and with tasks that they like to do. This often produces a hollow feeling of accomplishment, for they may get a lot done and enjoy doing it, but they have not added a lot of value to customer service or the organizational goals. Keep in mind when setting priorities in the workplace that your No. 1 focus should be your customers and activities that support them. Be Realistic About Timing. Reality and deadlines have a way of dictating priorities. The starting time of a project or task also may establish priorities. Once you begin a task, there must be enough time to finish it. If this is not possible, you may have to prioritize or seek assistance. The key is to be realistic about the time it will take to complete a task. Make sure that you schedule that much time, plus a little extra, on a daily planning sheet that you create. Also, consider your peak time period for performance. This is your circadian rhythm – the internal clock that makes you more energetic either in the morning or evening. Each person typically has a period of the day in which he or she has more energy and can get more done. Capitalize on your peak period and schedule high-priority tasks during that time, if possible. Time management is not a secret. It is a learned and practiced behavior. If you want to improve, you can do so. There are many resources online, in classrooms and in books and other materials. Make time to assess, evaluate and improve. Only you can do that. For additional ideas on time management in customer service, review other similar articles on this blog. Also, check out Please Every Customer: Delivering Stellar Customer Service Across Cultures for information about how customers from different cultures perceive time and ideas for interacting with them. What are strategies that you use to improve time usage in your customer service environment? Share them with other readers below. 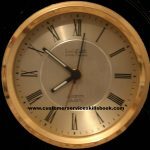 This entry was posted in Customer Service, Time management and tagged time management in customer service, Time management skills for customer service representatives, time management tips for customer service professionals. Bookmark the permalink.